The filling can be prepared the day before and kept in the refrigerator. To make the filling you can either chuck everything in the food processor and blend to yield a smooth filling – or you can mince everything by hand for a chunkier filling. If you are using the food processor method, I recommend putting the whole water chestnuts in the food processor first. Then coarsely chop the shrimp and toss it in. Chop the ginger and scallions pretty well. Add the rest of the ingredients and push go. Not too long if you want a chunky filling. Take 1 package shu mai, wonton or dumpling wrappers, round out of the freezer at least one hour before you are ready to start making the dumplings. Shortly before you are ready to steam them, make the dumplings. 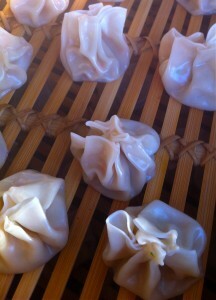 Hold the dumpling wrapper in the palm of your hand and place one rounded teaspoon of filling in the center. Cup your hand around the wonton wrapper, gathering folds up around the filling. Press the gathered folds lightly around the filling to adhere, forming a cup-shaped dumpling. NOTE: The picture shows the dumplings pinched together at the top. I forgot to that a photo when I made them for Chinese New Year’s when I put double the filling in and left it open on the top like a cup. Fill the pan under the steamer with enough water to almost reach the bottom of the steamer basket and begin heating. Lightly oil your steamer basket and place dumplings in basket ½ inch apart. When the water is getting close to boiling lower steamer into pan, cover and steam until the dumplings are cooked through, about 8 minutes.